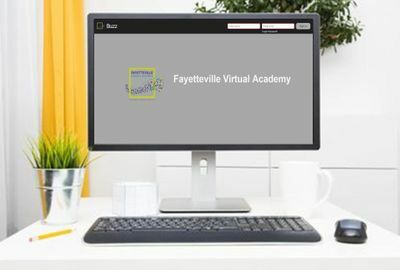 Fayetteville Virtual Academy offers a wide variety of virtual courses that meet the needs of all types of students. FVA Students enrolled in 4 or more virtual courses may access the entire course catalog, including the electives that are available to all high school students in the Fayetteville Public School District. Access the sample lessons by clicking on the names of the courses below. When you land in the sample lesson, click "Menu" and select the lesson. Join us in English 9 for a series of journeys. In each unit of the course, we embark on a new journey. Through the study of literature, nonfiction, and life, we will explore the unknown, search for identity and equality, and seek achievement, opportunity, and understanding. You will read to analyze the way language is used to express human motivation and will research to examine the results of actions in the real world. The lessons in each unit will give you the tools you need to gain insights from what you read and to use your knowledge in creative and analytical writing. In English 10, students learn how the human experience – real life – is the foundation of the best stories, plays, poems, films, and articles. The four modules – Live Love Laugh, Obstacles, Fear, and Betrayal – allow students to focus on particular aspects of the human experience. Throughout the course, students explore what it means to be human, what it means to be fulfilled, challenged, transformed, and intellectually active. Designed to meet Arkansas State Standards, the course takes an in-depth look at pieces of literature through close readings, the use of textual evidence in writings, the creation of arguments through research and facts, and the application of writing and revision strategies. Additionally, students will encounter new vocabulary and vocabulary acquisition strategies, learn and refine the grammar and mechanics of their writing, discover the power of literary devices, investigate structures, and engage in thought-provoking projects. “Extra, extra, read all about it!” It’s all right here in black and white, in the pages of The Virtual Times newspaper. Published at key periods in American history, The Virtual Times takes us right into the action. The writing is clear and concise. The stories and opinions give us perspective. The sports and entertainment sections give us the color and flavor of the times. In English 11, the writing and insights of authors throughout our history are collected in the fast-paced pages of The Virtual Times. Students gain an appreciation of American literature and the ways it reflects the times in which it was written. They discover how people thought and lived and wrote about their experiences. Students are also asked to observe, investigate, and report on stories of today. The goal is for students to be thorough, accurate, and compelling in their writing. An AP course in English Language and Composition engages students in becoming skilled readers of prose written in a variety of periods, disciplines, and rhetorical contexts and in becoming skilled writers who compose for a variety of purposes. Both their writing and their reading should make students aware of the interactions among a writer's purposes, audience expectations, and subjects as well as the way generic conventions and the resources of language contribute to effectiveness in writing. The college composition course for which the AP English Language and Composition course substitutes is one of the most varied in the curriculum. Come explore the world of big ideas in English 12, where you are able to choose which path you will travel first as you explore highly-engaging, thematic units. Each path will guide you through a series of literary pieces that allow you to analyze the political, social, economic, and cultural messages of its time as well as its relevance to the world you live in today. Each path revolves around a central theme. The works in the course span a period of over 1000 years and have been written by authors who share common ideas, but employ a variety of literary genres to express their views. Whether it is the dramatic ending of a play, or the colorful images in a verse of poetry, the words of these authors will leave you with a new understanding of the world around you. As you travel down each path, you will create authentic work pieces that will engage you in higher-level learning and provide you with a greater understanding of literature and its connection to the world. For a year, participate in an AP upscale dining experience in the AP Literature and Composition course. Students act as food critics of exquisite literary cuisine. Menu items include reading, analyzing, writing, rewriting, and discussing creations by the master chefs, renowned authors. With intensive concentration on composition skills and on authors' narrative techniques, this dining experience equips students with recipes for success in college, in a career and the AP exam. applying linear models to data that exhibit a linear trend, and students engage in methods for analyzing, solving, and using quadratic functions. This course allows students to learn while having fun. Interactive examples help guide students’ journey through customized feedback and praise. Mathematical concepts are applied to everyday occurrences such as earthquakes, stadium seating, and purchasing movie tickets. Students investigate the effects of an equation on its graph through the use of technology. Students have opportunities to work with their peers on specific lessons. Algebra II is an advanced course using hands-on activities, applications, group interactions, and the latest technology. level thinking skills developed in Algebra II through a more in-depth study of those concepts and exploration of some precalculus concepts. situations is an important part of this course. Sequences and series will be used to represent and analyze real world problems and mathematical situations. Algebra III will also include a study of matrices and conics. Students, as mathematic analysts, will investigate how advanced mathematics concepts can solve problems encountered in operating national parks. The purpose of this course is to study functions and develop skills necessary for the study of calculus. The Pre-calculus course includes analytical geometry and trigonometry. This course teaches the foundational concepts of physics and chemistry. Using scientific inquiry, interactive experiences, higher order thinking, collaborative projects, and real world application students are able to demonstrate an understanding of the physical and chemical properties around them; enabling them to apply these properties to their everyday lives. This course guides students through the study of living and non-living systems and how they interact with one another. Students explore the world they live in by posing questions and seeking answers through scientific inquiry. Discovery takes place through observation and data collection. The students will be introduced to the structure, function, diversity, and evolution of living matter. This is a course with real relevance. It encourages curiosity and provides opportunity for students to work on hands on lab activities and develop relationships through collaboratively learning. Engaging in the study of biological science broadens the picture of the world around us. Chemistry I and Chemistry I Honors are rigorous and not intended for credit recovery. This course contains several laboratory investigations that include the use of scientific inquiry, research, measurement, problem solving, laboratory apparatus and technologies, experimental procedures, and safety procedures that are an integral part of the learning experience. This course is designed as an interactive, 21st century course. Topics include the composition, properties, and changes associated with matter and their applications. This course serves as a foundation for the study of Chemistry. The utilization of scientific inquiry, interactive experiences, higher order thinking, collaborative projects, real world application all aid the student in ultimately demonstrating a vast understanding of the importance of Chemistry in the world around them; enabling them to apply these properties to their everyday lives. In each module of Physics I, students discover the contributions of scientific geniuses like Galileo, Newton, and Einstein. Through their work, students learn the concepts, theories, and laws that govern the interaction of matter, energy, and forces. From tiny atoms to galaxies with millions of stars, the universal laws of physics are explained through real-world examples. Using laboratory activities, simulations, images, and interactive elements, students follow in the footsteps of some of the world’s greatest thinkers. This challenging course is designed to provide a college-level experience and prepare students for the AP exam in early May. Over two semesters, the students are engaged in a wide variety of activities, with substantial emphasis on interpreting and collecting data in virtual labs, writing analytical essays and mastering Biology concepts and connections. The key themes of the AP Biology course are: the scientific processes, the affects of science on technology and society, the chemistry and make up of living organisms, genetics, diversity, and evolution. Throughout this course you will be expected to answer questions, reflect on issues and complete lab activities. The primary emphasis is to develop an understanding of concepts rather than memorizing terms and technical details. The course will successfully prepare you for the AP Exam in May. AP Environmental Science provides students with the scientific principles, concepts, and methodologies required to understand the interrelationships of the natural world. Students identify and analyze environmental problems that are natural and human-made. They evaluate the relative risks associated with these problems and examine alternative solutions for resolving or preventing problems. Laboratories support student content mastery in both hands-on and virtual experiences. The United States began as an experiment in freedom and democracy. Since its establishment, the country and its people have endured social, political, and economic revolutions. In this course, students will investigate the people, events, and ideas that have shaped the United States from the end of the Civil War through today. Students are asked to analyze and evaluate decisions made by political, business, and military leaders. Emphasis is placed on connections between events of the past and present. This course also gives students the opportunity to conduct research and apply their learning to current, real-world problems. AP United States History focuses on developing students’ abilities to think conceptually about U.S. history from approximately 1491 to the present and apply historical thinking skills as they learn about the past. Seven themes of equal importance —American and national identity; politics and power; work, exchange, and technology; culture and society; migration and settlement; geography and the environment; America in the World— provide areas of historical inquiry for investigation throughout the course. These require students to reason historically about continuity and change over time and make comparisons among various historical developments in different times and places. Responsible citizenship, including civil and political participation is essential to maintain a representative government that truly represents the people of the United States. In this course, students learn about the structure of government and how it shares power at the local, state and federal levels. This course also explores founding principles that inspired the Constitution and Bill of Rights, preserving the freedoms that students experience daily. Students will examine the processes of each branch of government, the election process, and how citizens can impact public policy. The media, interest groups and influential citizens provide examples of how the government can be effected by informed and active participants. Students will examine the U.S. Court system, and become a part of the process by participating in the judicial decision making process. They will also discover ways the United States interacts with countries around the world, through domestic policy, foreign policy and human rights policy. In Semester I, students will learn how the Roman Empire developed in two very distinct directions. Next, students will discover the great intellectual and cultural contributions of Islamic Empires. Journey through the Middle Ages of Europe and Japan to learn how knights and samurais lived. Students will also investigate the rise and fall of some of the great kingdoms of the Americas and Africa and then travel back to the Europe of the Renaissance and Reformation era. Segment II begins with a bang as students will learn about advancements in science and thought during the Age of Enlightenment and the social and political revolutions that followed as a result. As students meander through the 19th century, they will learn about the transformation from an agricultural to an industrial world and the many changes that resulted from that shift. Students will then learn about the interconnectedness of nationalism and colonialism and the two massive world wars were the end result. As students approach the finish line, they will learn about development in our modern world and the implications that historical events have on us today. Economic decisions affect us every day of our lives. Understanding economics means thinking about how scarcity, or limited resources, requires us to make choices and evaluate one option against others. In this course, students will recognize examples of economics in your daily life. Students will see how the economic choices of larger groups, like businesses and governments, affect students and others. As students progress through the course, students will recognize that the costs and benefits of choices connect individuals and groups around the world. The purpose of this course is to help students become a smart consumer who understands the flow of an economy between individuals, businesses, governments, and the rest of the world. Students must take the Advanced Placement Exam in order to receive Advanced Placement credit. Students who do not take the AP® Exam will be awarded Honors level credit. You traveled to the Macro Islands to assist the leader in winning re-election. You came for a job, but you realized as you were working that you loved the islands and wanted to make your home there. Because you are adept at giving economic advice to the leader, you have been appointed as the new President of the Sunny Seas Shell Company. As part of your role in assuming the leadership duties of the company, you will need to brush up on microeconomics. The Board of Directors has appointed Ms. Equilibrium to act as your personal assistant and advisor as you transition into your new role. You will be learning all you can about microeconomics and will be required to exhibit your knowledge in May at the annual Board of Directors’ meeting (the AP Exam). AP Psychology is a college-level course providing students with an overview of the development of human behaviors and thoughts. Along with preparation for the AP Psychology exam, the goals of this course are to immerse students in modern psychological investigation techniques, to accentuate the ethics and morality of human and animal research, and to emphasize scientific critical thinking skills in application to the social sciences. Psychology is a diverse social and biological science with multiple perspectives and interpretations. The primary emphasis of this course is to help students develop an understanding of concepts rather than memorize terms and technical details; the ultimate goal is to prepare students to successfully take the AP Psychology examination offered in May. What comes to mind when you think of marketing? Does a favorite commercial jingle begin to play in your head? Or do you recall the irritating phone call from a company trying to sell you software you already have? No matter what your feelings are about it, there’s no denying the sheer magnitude of the marketing industry. Every year companies spend $200 billion promoting their products and services—and that’s in the United States alone! Experts estimate that by the time you turn 65, you will have seen nearly 2 million TV commercials, not to mention radio ads, billboards, and online advertisements. You’re familiar with what it’s like on the receiving end of a company’s marketing efforts, but what’s it like on the other side? In this Advertising and Sales Promotions course, you’ll learn how marketing campaigns, ads, and commercials are conceived and brought to life. You’ll meet some of the creative men and women who produce those memorable ads and commercials. And you’ll discover career opportunities in the field to help you decide if a job in this exciting, fast-paced industry is in your future! Science and technology are revolutionizing may areas of our lives, and agriculture is no exception! From aquaculture to genetic engineering, agriscience is finding new ways to better produce and manage plants, from the field to the garden. In Agriscience II, you’ll build on your existing knowledge of plant science and delve deeper into important areas such as soil science and weed management. You’ll learn more about horticulture and plant science trends from creating hybrid species to growing edible plants in unlikely places. In today's world, biotechnology helps us grow food, fight diseases, and create alternative fuels. In this course, students will explore the science behind biotechnology and how this science is being used to solve medical and environmental problems. For many hundreds of years, literature has been one of the most important human art forms. It allows us to give voice to our emotions, create imaginary worlds, express ideas, and escape the confines of material reality. Through creative writing, we can come to understand ourselves and our world a little bit better. This course provides students with a solid grounding in the writing process, from finding inspiration to building a basic story to using complicated literary techniques and creating strange hybrid forms of poetic prose and prose poetry. By the end of this course, students will learn how to discover their creative thoughts and turn those ideas into fully realized pieces of creative writing. Is there life on other planets? What extremes can the human body endure? Can we solve the problem of global warming? Today, scientists, explorers, and writers are working to answer all of these questions. Like Edison, Einstein, Curie, and Newton, the scientists of today are asking questions and working on problems that may revolutionize our lives and world. This course focuses on 10 of today’s greatest scientific minds. Each unit takes an in-depth look at one of these individuals, and shows how their ideas may help to shape tomorrow’s world. Food is all around us—we are dependent on it and we enjoy it. This course will give you the basic fundamentals to start working in the kitchen and gaining experience as you explore and establish your talents for cooking and preparing food in a creative and safe way. You will learn safety measures as well as enhance your knowledge of various types of foods and spices. If you enjoy hands-on learning and want to deepen your knowledge about culinary arts, this is a great course to start. Forests and other natural resources play an important role in our world, from providing lumber and paper products to providing habitat for birds and animals. In the Introduction to Forestry and Natural Resources course, you’ll learn more about forest ecology, management, and conservation. You’ll explore topics such as environmental policy, land use, water resources, and wildlife management. Finally, you’ll learn more about forestry related careers and important issues facing forestry professionals today. You’ve probably seen an old movie about a hotshot naval aviator, or perhaps a more recent film about the daring actions of Special Forces operatives. But do you really know what careers the military can offer you? Introduction to Military Careers will provide the answers. The military is far more diverse and offers many more career opportunities and tracks than most people imagine. In Introduction to Military Careers, you’ll learn not only about the four branches of the military (and the Coast Guard) but also about the types of jobs you might pursue in each branch. From aviation to medicine, law enforcement to dentistry, the military can be an outstanding place to pursue your dreams. Running a holiday sale or weekly special? Definitely promote it here to get customers excited about getting a sweet deal. Music is part of students’ everyday life. In this course, they learn how to understand the impact of music as well as how it represents the culture it was created within and reflects the spirit of the human condition. Students learn to know and understand music by being able to distinguish and identify cultures on both local and global levels. Students meet musicians and composers and learn how their music continues to influence what is listened to today. In this course, students gain a historical perspective of music, covering a variety of styles and developments from the Middle Ages through the 21st century. In their musical journey, students acquire basic understanding and knowledge of singing, listening, and playing instruments. Partnering those skills with an understanding of music composition and improvisation will make future music experiences more informed and satisfying. Have you opened a new location, redesigned your shop, or added a new product or service? Don't keep it to yourself, let folks know. Food has to travel from the farm to the table, and in Agriculture and Natural Resources, you will learn about all of the steps in that journey, beginning with the history of agriculture through animal husbandry, plant science, and managing our use of natural resources. In this course, you will receive a broad understanding of the subject matter, preparing you for future hands-on learning, participation in Future Farmers of America, and supervised agricultural experiences. Have you always dreamed of running your own restaurant? Maybe you want to manage a restaurant for a famous chef. What goes on beyond the dining room in a restaurant can determine whether a restaurant is a wild success or a dismal failure. In Restaurant Management, you’ll learn the responsibilities of running a restaurant—from ordering supplies to hiring and firing employees. This course covers the different types of restaurants; managing kitchen and wait staff; food safety and hygiene; customer relations; marketing; using a point-of-sale system; scheduling employees; and dealing with difficult guests. Restaurant Management will prepare you for a steady career, whether you plan to buy a fast food franchise, operate a casual sit-down restaurant, or oversee a fine-dining establishment. Students will become aware of the challenges faced by social groups, as well as learn about the complex relationship among societies, governments and the individual. Each unit is focused on a particular area of concern, often within a global context. Possible solutions at both the structural level as well as that of the individual will be examined. Students will not only learn more about how social problems affect them personally, but begin to develop the skills necessary to help make a difference in their own lives and communities, not to mention globally. The Social Problems II course continues to examine timely social issues affecting individuals and societies around the globe. Students learn about the overall structure of the social problem as well as how it impacts their lives. Each unit focuses on a particular social problem, including racial discrimination, drug abuse, the loss of community, and urban sprawl, and discusses possible solutions at both individual and structural levels. For each issue, students examine the connections in the global arena involving societies, governments and the individual. Lights! Camera! Action! Let’s explore the enchanting world of live theater and its fascinating relationship to the silver screen. In Theater, Cinema, and Film Production, you’ll learn the basics of lighting, sound, wardrobe, and camerawork while examining the magic that happens behind all the drama. Delve into the glamorous history of film and theater, and examine the tremendous influence these industries have had on society and culture over the years. During this unit, you’ll discuss and analyze three classic American films—Casablanca, Singin’ in the Rain, and The Wizard of Oz—to help you learn how to critique and appreciate some of the most famous dramas of all time.